May 2018 - Around the world, the adverse impacts of climate change are being felt keenly by smallholder farmers. 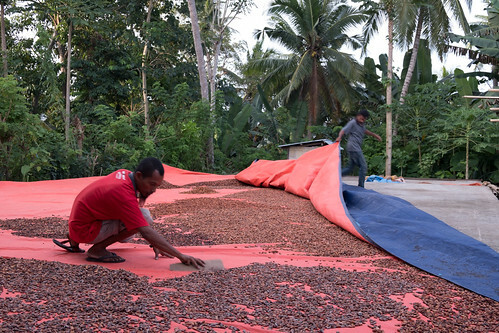 The UN Development Programme is now supporting Indonesia – a country in which around 30% of the population is employed in agriculture – to help acutely vulnerable farmers in Nusa Tenggara Timur to adapt. Nusa Tenggara Timur (NTT, or East Nusa Tengara) is one of Indonesia’s poorest provinces, with around 72% of households depending primarily on small-scale agriculture. Farmers plant rice, coffee, mais, corn, cashew, cocoa and other crops to make living. With their livelihoods dependent on their crops, changes in temperature and rainfall patterns can have dire consequences. Those holding less than two hectares of land are among the most at risk. These smallholder farmers face potentially being thrown into poverty as a result of losing income from production. The challenges are increasing for farming families as climate change brings harsher conditions and uncertainty. Aggravating their difficulties is the fact many have limited access to credit needed to invest in resilient agricultural practices – for example diversified crops, adopting drought-resistant seed varieties, or water harvesting technologies – and the equipment needed to support them. Remoteness, fragmentation of farming units, and wariness of financial institutions to do business with the agricultural sector (perceived as high risk) are hampering financial inclusion and resilience-building. Given projections of climate change impacts, the reliance of the population on agriculture, and the extreme smallness of agricultural operations in the province, it is urgent the sector transforms. To help address the issues, the Government of Indonesia engaged the UN Development Programme to develop a new targeted project. Now taking shape, the project is being designed in collaboration with the Coordinating Ministry of Economic Affairs; Ministry of Agriculture; Ministry of Finance; provincial and district governments; local agriculture agencies; local banks; farmers and other stakeholders. The project builds upon ongoing initiatives and already planned interventions in NTT, including a project funded by the Global Environment Facility-Special Climate Change Fund, focused on strategic planning and action to strengthen climate resilience of rural communities (SPARC). The new project aims to access finance from the Green Climate Fund to ensure climate-smart agriculture practices and technologies (such as access to drought tolerant species or improved drying process after harvest) are made available to the most vulnerable farmers. To make the agriculture sector in NTT more resilient to shocks, the ambition is to mainstream climate information into agricultural planning and operations, but also to catalyze public and private sector investments in the value chain, crucial to transformation of the sector. At the end of April, the UNDP project team, together with government representatives, traveled to areas near Maumere and Kupang. The team visited cacao nurseries, coconut, rice farms and other crop plantations, meeting with farmers, district and provincial representatives, agricultural agencies and other stakeholders. The team witnessed and heard about a range of challenges that farmers face. The team is now finalizing the scoping of the project’s intervention areas while continuing to engage with stakeholders – including government, cooperatives, local banks, farmers and others. UNDP expects to submit the funding proposal for Green Climate Fund Board consideration in 2018.